When my betrothed, Honoria Lucasta, had cautioned me about Skyrim, she wasn't concerned about the Nords: It went without saying that the hulking brutes with the social sophistication -- and hygiene -- of a tamed troll were to be treated with gentle condescension and alcohol. No, her main worry was the unrelenting cold. In fact, she had demanded I pack additional furs for this part of the journey (which were recently looted by the Reachmen). It is little wonder the Nords invade everywhere; they're obviously attempting to flee somewhere -- anywhere -- warmer than here. While the sweeping pine barrens and the ruggedness of the Velothi Mountains are captivating, it is difficult to enjoy these views when your eyeballs have frozen. Did I mention there were Nords here too? We materialized with a frightening thump across the bridge from the great gates of Windhelm. For all his bluster and hubris, I had expected Vanus Galerion to land us in the city itself. I was puzzled at our trek across the long, icy bridge. The cutting winds that howled off the Sea of Ghosts billowed through my ripped tunic; I required a meal, fine wine, a change of bandages, and some proper sleep -- not the roaring of a constant gale in my face. I had other concerns as well: I must complete this guide and present my evidence to the Chancellor Tharn forthwith. He must learn of the treachery of his nephew Javad and the evil of his advisor Mannimarco. With Vanus Galerion by my side, we were an unstoppable force! With renewed purpose, we advanced into the city (the guards escorted us to the Mages Guild). Galerion abruptly abandoned me as he went off for a private talk with the Hall Magister, vanishing without so much as a farewell wave. Typical Altmer behavior. Standing proud at the confluence of the White and Yorgrim Rivers, the oldest human settlement in Tamriel is a scarred and walled fortification with a queen concerned mainly with maintaining crude power and fiercely protecting the settlement's trade -- especially the Dunmeth Pass that leads to Morrowind. To understand the queen's firm grip on power is to understand this city's history: On every Thirteenth of the Sun's Dawn, the Feast of the Dead is held here, commemorating Ysgramor's historic sack of Saarthal, the gathering of the legendary Five Hundred Companions, and the routing of the Elves from Skyrim that led the First Empire of humankind. The palace of Ysgramor still dominates the center of the old city, now known as the Palace of the Kings. Today, Windhelm remains the only sizable city in the otherwise rural hold of Eastmarch. While Vanus Galerion tended to matters apparently more pressing than mine, I acquired some painting supplies and asked where I could find the local Jarl (or Snowthane, Pine Baron, or whatever bucolic title Nord rulers go by in these parts). It seems King Jorunn rules these parts -- not from the ruined Palace of the Kings (which the invading Akaviri burned and looted) but from Stone-Fist Hall. Almost 300 years have passed since Vanus Galerion, the contrarian Psijic, founded the Mages Guild on Summerset. His idea was to bring together the usually solitary individuals who studied magic, and while he felt this was for the public good, other saw it almost as an insurgency. The Psijic Order originally served the rulers of Summerset and included ancestral worship as part of its secretive, ritualized methodology. Galerion felt these rites were needlessly antiquated and raised suspicion among the laypeople. He brought the experimentation of magic to populated settlements and had the brashness to introduce potions, magical charms, and even spell scrolls and book to anyone -- from peon to monarch -- with the funds to buy them. As expected, this caused an uproar among the intelligentsia, who demanded he state these intentions more clearly (as some suspected a fractious group of renegades would usurp long-held power structures). Whatever charm Galerion exhibited in this meeting with the King of Firsthold, Rilis XII, worked, as the charter was approved. His impassioned pleas may have been laced with fears about the spread of necromancy across the lands, and to this day, this dark art is forbidden within the Guild. By initially remaining neutral in political affairs, the power of the Mages Guild only grew. 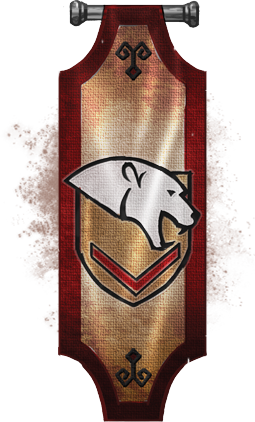 But Vanus Galerion began to distance himself from the organization and is rumored to have stated that "the Guild has become nothing more than an intricate morass of political infighting." Forcing my way through the courtiers in Stone-Fist Hall, I saw a particularly large bard, with lute in hand and a beard you could hide a baliwog in, serenading the court with an old favorite ditty of the Nords, "Ragnar the Red." He was really quite good. Stepping up to him, I interrupted his song: "Jester! While we wait for the Skald-King, have you any Imperial songs?" The room fell silent. A wizened and uncouth merchant manhandled me by the cloak, dragging me to my knees. "Has Sheogorath taken your mind, stranger? Jorunn Skald-King is no mere buffoon!" "Dear Mara... My humble apologies, Your Majesty!" I held up my hands, realizing my terrible error and feeling my face turn as red as a chokeberry. "No disrespect was intended." Jorunn erupted into laughter. "Eggvard, leave him be! But seriously, Imperial." His eyes narrowed. "You have insulted me. A price must be paid. Jester! Make me a limerick about Eggvard here." To forget the perpetual cold. To my surprise, I wasn't run out of town: the hall echoed with roars of approval. I don't think I've ever endured so many bear hugs. Born in 2E 546 to Queen Mabjaarn Flame-Hair, Jorunn was a singing talent of rare repute -- a blessing from Kyne some say -- and was trained at Skald's Retreat outside Riften. This sensitive princeling, taught by the eastern kingdom's most prominent bards, soon became the "Skald-Prince" thereafter. He stated no political aspirations, but his natural charisma always seemed to propel him to the forefront of his associates. Unlike many others of his ilk, his schooling in the arts of combat was minimal for a Nord prince. But it was put to test when the Akaviri of Dir-Kamal assaulted Windhelm. Jorunn's Pack of Bards was in Riften when the news broke: They fought north to the gates of Windhelm and fought admirably with blade and skill, from street to street. But the city fell, as did his mother and older sister, Princess Nurnhilde, both slain with much Akaviri blood on their swords. Devastated, Jorunn fled to High Hrothgar and pleaded for aid. The Greybeards replied in king, conjuring the great shade of Wulfharth the Ash-King, a formidable ally. The Ash-King and newly titled Skald-King were enraged and raised an army of Nords furious to fight. So strong was this presence that the Akaviri circumvented Riften, intent on marching on Mournhold. Into Morrowind the Akaviri spread, caught by surprise as the two kings' army followed them. Running up against Almalexia's Dunmeri legions in Stonefalls, the Akaviri were outmaneuvered and hard-pressed. Everyone was fighting ferociously, and it was only then that two regiments of Argonian shellbacks and their trio of Hist's finest battlemages arrived and turned the tide that the Akaviri line was fragmented. Thousands of their kind were routed into the Inner Sea to drown. With the invasion quashed, Wulfharth departed for Sovngarde, and Jorunn returned to claim the crown as King of eastern Skyrim. The pressing matters of the day seemed to be consuming meat and slapping thighs in time to some particularly bawdy rhymes. Resting between verses of "Nera the Naughty Nymph," Jorunn signaled me over the his throne. Standing to one side was a striking Nord woman, clean shaven with weather-beaten skin and deep blue eyes. "Flaccus Terentius of Bravil, meet Mera Stormcloak, Lawthane of Windhelm." She offered a smile. "You seem a little out of your element, friend." I grinned back. "No matter. Why not walk with me? Jorunn needs a head count of the local troops." When I hesitated, she said, "Don't worry, there will be plenty of mead." Moments later, she'd donned a thick pelt cloak, and we were walking the streets of snow-filled Windhelm. Ahead of the bustling markets and rowdy shouts from the townsfolk was an imposing military structure. Mera opened the door, and I counted seven Nords, who quickly stood from their table to bow at her. She drew two mugs of brew from a barrel and handed me one. "The Fighters Guild aren't part of the local peacekeepers," she said, downing the drink, then removing a ledger from her satchel, "but the king wants an accounting of them anyway." The mead was dense, exceptionally rich, and lit a fire in my belly the moment I followed Mera's lead and tried to down the mug. There were traces of fermented berry and a great dollop of honey. I instantly felt more clumsy. I remember leaving the Fighters Guild with Mera and have a vague recollection of entering the Windhelm Barracks. I sketched the building but am not sure when this occurred. I saw the Third Eastmarch Skirmish Company, who invited us in for a drink. Mera was leading the cheers in time to the pounding of a Nord smith repairing some armor. A Nord blacksmith feels a particular affinity with his anvil, bellows, hammer, and tongs. 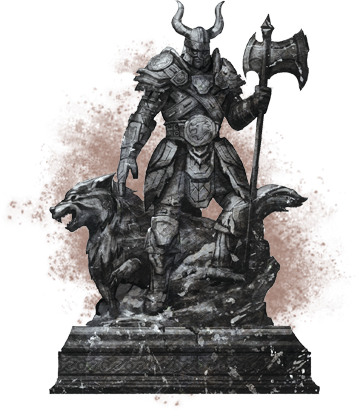 For the Nord, the creation of fine (if inelegant) weapons and armor is as important as proficiency with a blade, axe, or hammer. Such skills are learned from youth and are almost mandatory. As the Nord armorer and weaponsmith perfect their techniques, the forge becomes a second home. Close by is the tanning rack, where the hides of every beast in the north have been measured for their levels of durability and flexibility. The smith starts a weapon on the anvil with forged iron, then layered on top are iron, steel and corundum alloys. The result is a steel that holds tighter and bites sharper than weapons from other realms. When Nords refer to their blades as "stinging," they mean more than their cutting power: Superstitious Nord smiths are said to add a drop of wild bee honey into everything they create. The whys and wherefores are misplaced in long-forgotten lore, but the practice is widespread. To this day, no Nord armorer would work a forge without first crumbling honeycomb into his quenching tub. I couldn't tell you exactly what happened for the remainder of the day. We somehow escaped the clamor of the barracks. I'd had two more mugs of mead and felt bilious. At the expense of my dexterity, I'd worked out the berry taste was juniper. Mera helped me outside. Stendarr's beard, I was acting the fool. I remember being most put out by the disgraceful amount of dirty snow in the streets. I trod in some. That boot will have to be burned. I was placed by a Nord statue, which somehow struck me as hilarious. Crude and vigorous, like my hosts. More mead. No idea when I drew these. The Nord hero Ysgramor came to Tamriel from the northern realm of Atmora. Scholars vary in crediting Ysgramor with deeds of early Nord kings or battles with the trickster Herma Mora. Some Elven lorekeepers accuse Ysgramor of instigating the so-called Night of Tears through unknown blasphemies, while human scholars believe the Elf attack was unjustified. Elves razed the human settlement of Saarthal, with Ysgramor and his two sons, Yngol and Ylgar, the only survivors. While the Elves celebrated, Ysgramor retreated to Atmora, gathered a mighty force known as the Five Hundred Companions, and returned to rampage throughout Skyrim, driving his foes from their ill-gotten lands. Prior to routing the Elves, Ysgramor lost Yngol to the "sea-ghosts" (which may refer to phantasms or the maritime dangerous within the treacherous Sea of Ghosts). It was his order to erect a "great and wonderful fortification" on the north shore of the White River so he could personally watch over Yngol's resting place. That fortification became the fortress city of Windhelm, where his progeny ruled until 1E 369 and the demise of King Borgas. Despite no evidence to support this myth, Nords believe all their kings share Ysgramor's bloodline, no matter how diluted. I woke, shaking. Not from the cold, as I'd somehow found my way back to the barracks, but from a foul and fetid dream. Sweat had soaked the bedding, and my brand was burning. I remembered being hounded along the nighttime pathways of Windhelm, a pack of baying Daedra nipping at my heels. They were led by Mannimarco, who seemed to walk without footfalls. It was the mead giving me nightmares. Yes, that must be it. My head felt like it had been partially cleaved in two. I took some deep breaths, wrapped myself up in my moist attire, and stepped out into a blizzard. I needed an apothecarist to sell me potions to cure my head of my ails. As the abated slightly, I recognized many of the structures from my dream. I felt compelled to sketch them here, in case they meant something. 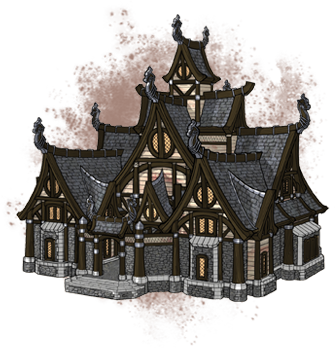 Nord architects are masters of crafting structures that last for generations, and (except in the cases of pillaging from invaders) even straddle eras of Tamriel's history. 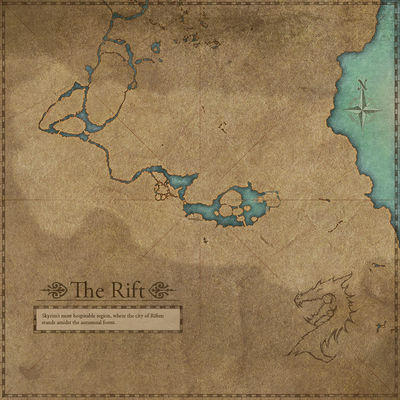 Examples of their habitats are seen across Skyrim and reflected in Solstheim and the Bruma region of northern Cyrodiil. Like it or not, we owe our northern neighbors a debt of gratitude in the construction techniques we Imperials have taken and perfected. Soon after the reign of Ysgramor, Nord stonesmiths created a method of erecting igneous rock. Initially, these blocks were hewed from porphyry deposits, although by the Second Era, they were somewhat supplanted by hard-wearing granite and volcanic stone from the eastern side of the province. Each block was slotted together without the need for seams or mortar, enabling huge towering walls to be constructed relatively quickly, even with irregularly-shaped stone. These proved difficult for marauders to dismantle, as evidenced by the Old Fort, a royal bastion on Skyrim's northern frontier, still standing after being built in the First Empire. Just how the Nedic settlers colonized Tamriel has ignited fierce debate among scholars ever since the first Atmoran ships were launched to escape civil wars in far-off lands. Although many Nords believe Ysgramor -- who established a force both battle-ready and cunning -- to be the first Nord of note, there is evidence of human footprints in centuries prior, mainly those discontent with life in the "Old World." Finding themselves foraging across lands already held by the Elven people, these immigrants found harmonious coexistence, and the Provinces of High Rock, Hammerfell and Cyrodiil began to flourish. Only the proto-Nords, with their antagonistic nature, held the notion that the land they stepped upon was theirs and theirs alone. And so the expansion of Skyrim continues, a fierce retort against the intermingling of the species. I'd have had better luck finding a hairless Khajiit than a potion merchant in this maze of filthy snow-laden avenues and thick granite walls. With good fortune, Mother Mara had tended to my splitting headache, and I remembered Mera Stormcloak telling me I was actually a guest at the Cold-Moon Inn. I made my way there and found her sitting by a long hearth with my belongings. What a relief! She waved me over with a smile and introduced me to Garthar Three-Fingers, the cook. I was offered various indeterminable lumps of a pig, along with bread and six eggs, all fried in a large pan of goose fat. As I stifled my bile from rising, Mera looked offended, so I agreed to tackle this unplanned feast. It duly arrived on a piled plate requiring two hands to lift. Aside from some heart palpitations afterward (which Mera explained were quite normal), the meal was rudimentary but absolutely delicious. I declined her offer of another mug of mead. Mera laughed and said, "If you really want to drink, you must meet my battle brother Holgunn One-Eye." 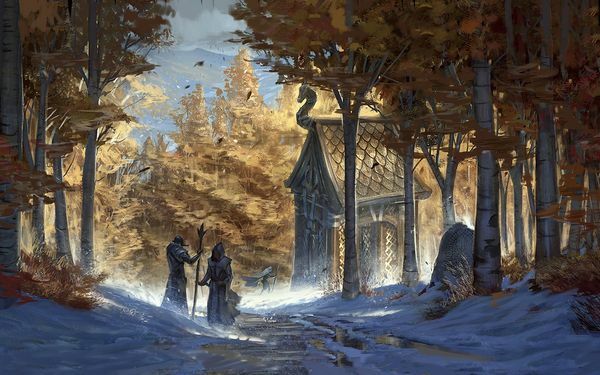 The whistling winds and thick pelting snow showed no signs of letting up as we slogged our way to the thick oak door of the Sober Nord Inn, the ironically named tavern where alcohol flowed only slightly more freely than the other locations I'd visited. A blast of heat from the hearth and the warm Nord bodies struck us as we entered. Mera was received with a cheer. Holgunn -- as large and burly as any Orc I'd seen -- stood up to greet us and enveloped me in a hug that almost crushed my windpipe. He was armed with a giant hammer, various daggers, and a hand axe, and he wore thick steel armor, even in town. "We drink to honor the dead, Imperial!" Holgunn's voice boomed through my skull. "I'll try a weak ale, please," I answered. Holgunn's left eye twitched noticeably. "Ha! It's mead you'll have in these parts, you milk-drinker!" I resigned myself to another night's festivities and watched Holgunn gulping down brew as if it were ice water, and apparently to the same effect. He told stories of his actions during the recent Akaviri invasion: trekking with the Pack of Bards to a pitched battle within the walls of Windhelm, conquering the Seven Thousand Steps to reach the Greybeards of High Hrothgar, expelling the Akaviri despoilers from Riften, and fighting in the great battle at Stonefalls where the inland seas turned red with Akaviri blood. I meticulously wrote this history down, from Holgunn saving Skald-King Jorunn from an enemy's arrow to his epic account of fighting alongside Wulfharth, the mythical Ash-King, and his diplomacy with the Dunmeri leaders (which included a drinking competition with General Tanval Indoril that lasted almost a week). I corroborated it all with Mera Stormcloak and then mislaid my secondary parchments entirely as the merry throng turned into rowdy debauchery. despite this, Fjori expired from her exhaustion. So distraught was Holgeir that he had the great tomb Ansilvund excavated and his love interred. Soon after, he allowed the snake to bite him a second time and joined her at the eternal hunt in Sovngarde. 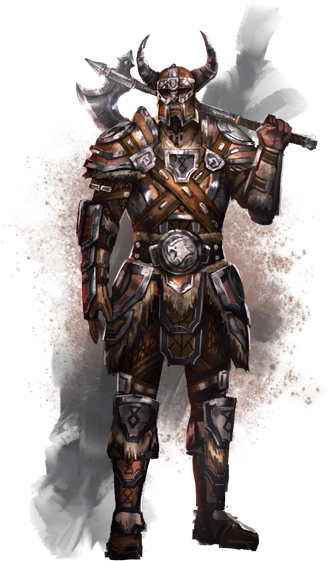 Holgunn One-Eye was a Nord commander known for his wolfish grin and the ability to overcome hostile adversaries with his rough charm (and if that failed, his skill with a variety of bludgeoning weapons). 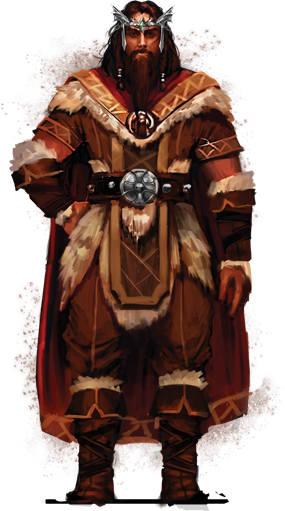 He played a pivotal role in sewing together the blanket of trust between Nord and Dunmeri forces, which ended their hostility towards each other and allowed them to come together against the Akaviri. Holgunn has strong bonds with General Tanval Indoril of the Tribunal Army. The two of them are thick as thieves. I emerged from my room the next morning in Holgunn's guest quarters with an empty bladder and a full chamber pot. "Ready for the hunt, my friend?" Holgunn asked with a wink. "Kyne offers us calm weather, and Ingjard has already seen sabre cat tracks. We run within the hour." As I chewed on fresh meat and herbs, Mera introduced me to Thorbjolf the Red and Ingjard Stone-Hand, two ferocious-looking Windhelm firebrands who completed our hunting party. "What hunting party?" I inquired. "The one you insisted we organize. We agreed to make matters more interesting, as you demanded." "More interesting?" I had a void where these memories should have been. "Yes! We hunt with bows, short swords and knives. No long weapons. We agreed to your challenge!" While the foursome affixed their satchels and strung their bows, I sank down in my seat a little. Mead had once more possessed my brain and clouded my judgment. Nestled close to the clouds on a peak overlooking Eastmarch is the sky temple of the Greybeards, a monastery of silence known as High Hrothgar. To find the ancient and honored Greybeards, one must navigate the treacherous Seven Thousand Steps up the Throat of the World mountain and risk encounters with the monstrous hosts that lurk between praying posts along this path. Rarely interacting with visitors (who leave offerings before braving the descent), these solitary monks are almost utterly without speech -- quite a juxtaposition to the region's rowdy drunkards -- preferring instead to attune themselves to the "Voice of the Sky." Such strange and powerful yells are known as "Thu'ums," first meditated on and discovered by First Era Nord hero Jurgen Windcaller, if the stories told to wide-eyed visitors have a shred of truth to them. What I initially pictured as a terrible prospect -- traveling into the Skyrim wilds with four unruly idiots -- was actually rather exhilarating. My more unpleasant preconceptions of the Nords were without merit: Of course they were loud and boorish. Yes, their streets were streaked with yellow and brown snow. But they exhibited a strength of character and friendliness to my presence that I have rarely encountered. Holgunn persuaded me to abandon my Imperial clothing. To my surprise, the bear-skin overshirt, leather breeches, and firm snow-wolf boots were both pliable and well fitting. Once I got used to the smell, the fur cloak was both comfortable and cozy. With my hunting attire sealing in the warmth, we left Windhelm for the snowy hills of Eastmarch. Up by the tree line, close to a high cave, Ingjard quickly crouched down, drew her bow, and fired before I'd even seen the beast she targeted. I stayed behind her with my own arrow at the ready as the three other Nords spread out. Mera charged and plunged a dagger into the neck of the cat, wrestling it as blood spurted onto the snow. It soon died, and I sketched its carcass for posterity. This was a violent interruption to a long hike and stories around the fire. Ingjard had lost part of her right hand fighting a werebear, but her wound hadn't diminished her painting ability. Mounted on this page is a piece she gladly gave me. It shows the valley leading to High Hrothgar, although Holgunn informed me the buildings were positioned in a most fanciful fashion. No matter; the depiction of the aurora, or "Kyne's lights," is both accurate and exquisite. As I rested below the glow of greens and purples, I felt at peace in Tamriel's grand wilderness for the first time. By the evening of the second day, we were well above the tree line, in the windswept crags of the Velothi Mountains. After erecting our spacious tents, with pitched and oiled roofs that allowed the snow to slide right off, I inspected the kills -- two snow foxes, a wolf, and a bear. I then sat by the roaring fire, sipping my mead and secretly spilling some behind my log seat; just to keep the pretense up that I was matching others' consumption. Holgunn told us a gripping story of a ghostly giant who haunts these mountains. Returning to this world after a pact with Hircine, he clambers the hills and valleys in fretful search for his lost giant wife. Woe betide those who cross his path; the forlorn spirit possesses an icy ghost club with which he freezes Nords solid before devouring their immobile bodies. Retiring to my blankets, I felt a chill wind whistle through the tent, and shivered as if something were wrapping its vague form around my soul. Are giants the true "ancestors" of the Nord people? Of course not, but this hasn't stopped the more backwards residents of Skyrim -- those hunters or small band of villagers living in rural hamlets -- from believing they are related to the huge human-shaped creatures that are occasionally found lurching across the more desolate landscapes of Skyrim, tending to their mammoth herds. This belief thrived in the First Era, when Nords would select a prized cow for neighboring giants to eat, painting it with bright runes so the giants would know which of the herd to gnaw on. 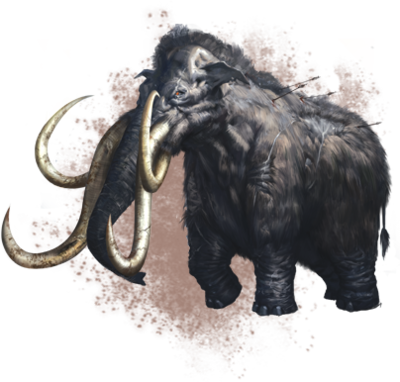 Nowadays, this superstition is less prevalent, with more forward-thinking Nords realizing that giants are an annoyance and their mammoths a threat to their grazing lands. Giants keep to themselves, rarely interacting with each other, and seem to feast on many types of meat (except human flesh), as well as cheese and curds they get from mammoth milk. They cook their food in huge fire pits, where they keep the hides they've skinned warm and dry. Our third day of the hunt was fruitful. We descended into the high forests, Nord horns blowing after bagging a lunch of rabbit meat and a dinner of wild mushrooms and venison. As Thorbjolf fried up the meat, Mera Stormcloak entertained us with a tale of an ancient Snow Elf wizard named Serenarth. As I sketched, she spoke of an encounter the Elf had had with Ysgramor's companions during the Night of Tears, as both sides fought with fury over the razing of Saarthal, the first Nord settlement. Ysgramor's bow aim was swift and accurate; he felled the mage with an arrow from his bow, Long-Launcher. As the Nords pressed on to reclaim their city, Serenarth lay cold and dying. With his last strength, he summoned a mighty frost atronach, and through a bargain with unknown but malevolent forces, he traded the Daedra's spirit with his own. To this day, Serenarth's host form waits, encased in ice within a glacier close to where his frozen corpse still lies, destined to thaw out and seek vengeance on Ysgramor's heirs. After formidable conjurations by battlemage Quiricus Vidacilius during recent skirmishes in the northern wastes, we can present unusually accurate evidence regarding this powerful Daedric elemental. The frost atronach was summoned with expediency. 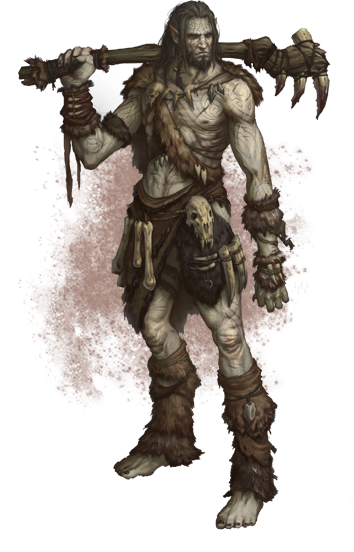 It stood tall and imposing but was devoid of culture and personality -- not like a Reachmen, but as a troll or base creature would be. They are aggressive only when provoked, and they lack the nimbleness of their fiery cousins. However, the frost atronachs' attacks against their Nord victims were effective, slowing them down and pulverizing bone and brain. Resistant to magic originating from ice and cold, they crumble and finally yield to sustained attacks. Their remains include frost salts, a sought-after ingredient in various concoctions. I have no hesitation in recommending their use as sentinels or shock troops. In the distant reaches of Skyrim, beyond the remote farming communities and hunter shacks, you may stumble over a broken stone, half buried and covered in moss and ivy. Look closer, in case these are effigies to animal gods, worshiped by Ysgramor's primitives. The deification of the bear, dragon, fox, moth, owl, snake, whale, and wolf have all been recorded by our field agents, and many believe these totems stand as sentinels over lost ruins. These tumbledown temples, guarded by half-woken draugr and worse, are from a time when the Dragon Cult supposedly ruled this province. While no modern Tamrielan need believe these hopelessly fanciful fables, the Nords' simple-minded veneration for these places betokens their fear of the return of the Dragon Priests. During the worship of Akatosh (the dragon) as god-kings over men, these priests were the conduit through which dragons spoke, made laws, and were honored with grand and elaborate temples. When Alduin, Akatosh's firstborn, was defeated atop the Throat of the World during the mythical Dragon War, the cult that sprang up around these dragon guardians soon receded into the soil, buried among dragon mounds with the remains of these beasts. They were finally vanquished in the Rift mountains by High King Harald in 1E 140. The veneration of animal gods was soon replaced by the Eight Divines. Ingjard spotted movement between the flurries where I saw only walls of snow. Scrambling up high into the mountains, I finally spied an old female sabre cat hunting rabbits. Too far for our bows, we pursued our quarry up into low clouds and between rocks of various slipperiness. We finally halted at a set of ruins draped across an upper escarpment: a great monument to resting bones. I inquired about this strange place. "This is Skuldafn," Mera replied. Thorbjolf watched the cat disappear into the ruins. 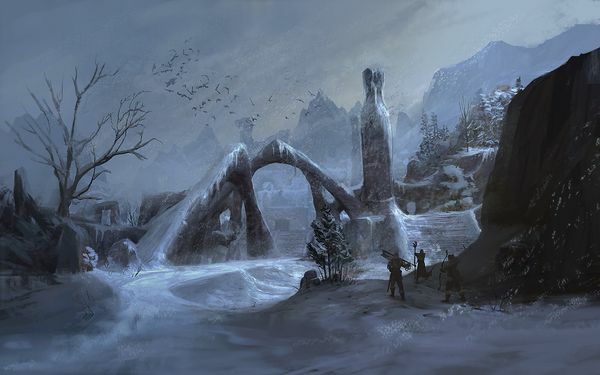 The Nord returned without crossing the threshold; the snow-covered arches seemed to forbid his advancing, while stone totems to ancient animals stared back at us with silent malevolence. It was a most eerie sight. Holgunn beckoned our party back and away from the place. All he said was, "Don't enter the Dragon Temple." I continued to pry reasoning from him until Mera grabbed me by the shoulder. "Do not pester Holgunn about this," she whispered. "These Dragon Priests stood at the right hand of Alduin." While Morrowind is renowned for its geothermal anomalies -- a cracked and rumbling domain with scars and fissures that belch vapors from Nirn's crust -- this volcanic activity bleeds over into the eastern regions of Skyrim. The host springs and sulfur pools of Eastmarch are a hive of bubbling activity, and despite the sometimes pungent smell and disorienting mists, these ponds and lakes are reputed to have therapeutic properties. Unfortunately, the area is the favored haunt of giants, making proper investigation of these claims a low priority. My weather-beaten face finally warmed up as we took our first steps into an eerie terrain of burbling hot springs and steaming fumaroles. I ventured down to a collection of vast green ponds, almost luminescent in color. In the mid-distance, Mera saw a large figure plodding through the sparse landscape, and the party set off to meet the giant. I dipped my toes in the roasting water of the hot springs and felt a shiver of warmth. This joy was lessened somewhat by the smell. I first thought Thorbjolf was cooking eggs, but this was a strange gas that left a bitter taste in my throat. The steam grew thicker as it mingled with fog rolling down into the plains, and I lost sight of my friends. I tried without luck to find the hunting party before nightfall. The best I could manage was hearing their horns, echoing faintly in the distance. 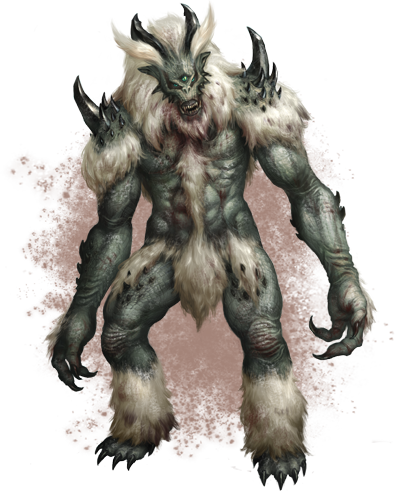 Skirmish units within the northern wastes report encounters with a three-eyed, shaggy creature standing on hind legs but with two powerful forearms that stretch to the ground. These forelimbs allow vicious pummeling strikes that have been known to rip through tent cloth and bend still armor. Much like a minotaur, it possesses only rudimentary intelligence and usually resides in caves and overhangs filled with the carcasses of kills. Frost trolls tend to have base cunning, as they can circumvent traps before attacking. In addition to arm strikes, they can leap and maul and pound the ground, but they tend to shrug off attacks instead of fully defending them. Instead, they rely on innate regenerative powers to heal themselves. Such abilities are of great interest to our battlemages, so attempt to capture live specimens if possible. In all other cases, burn their carcasses after death. Lost! I scrambled up a scree of loose rubble, the horns and mists both fading as I navigated back to more frigid temperatures. I found myself wandering into woods of fir and pine. Picking my way through the trees, I suddenly heard wild grunting and was thrown to the ground. An ugly thing blinked thrice. It snarled, revealed rows of pointed teeth, and prepared to pounce when three armored shapes flew past me and tore into it. "Eat my horse, would you?" the beefiest of the three yelled as his two-headed axe cut deeply into the troll's arm. The appendage dangled grotesquely from its remaining muscle before the beast was dispatched, its body staggered by arrows driven into it by a second warrior. The broad-shouldered Nord with the axe smiled. "Well met, stranger. I am Vigrod Wraithbane the Harbinger. These are my Shield Brothers Uli and Rargal. We are of the Companions." Making camp in the rough, Vigrod explained that his Companions traveled with little equipment to slow them down, spending their nights in caves and dells instead of under tents. Sitting around the fire, Uli and Rargal were guarded, focusing on the care of their weapons, but Vigrod was more sociable and spoke of his friendly rivalry with Holgunn One-Eye. I asked of his loyalty to the Skald-King, and he proudly told me of swearing fealty to this throne, in spite of his clan's tradition as mercenary sellswords. The next morning Vigrod agreed to take me with them as they hiked south, to their home at Fallowstone Hall in the Rift hold. As the alternative was to become troll fodder, I agreed. We marched past more hot springs, and as my boots became thoroughly worn in, I watched the snows slowly recede, and as we topped a pass, a broad deciduous woodland spread below us. In the cold wastelands of the Nords, the chaotic misrule of their High King is further undermined by the forces of the Companions, a group of sellswords whose loyalty lies only in bettering themselves. But these are not Orcs; these is some semblance of a hierarchy. A band of soldiers, thugs, or bandits with a longing for more structure in their miserable existence is brought together by a Harbinger, a leader who professes to teach honor and resolve disputes but without reigning over the Companions directly. His word is sacrosanct throughout all holds, as is the veneration of Ysgramor the Invader. But what of the Harbingers past and their rule? After Ysgramor came Jeek of the River, the founder of Whiterun, Jorrvaskr and the Skyforge within its walls. He favored glory not in conquest but in helping those without the skill or will to wield a weapon. Under the rule of Mryfwiil the Withdrawn, the ludicrous practice of Companions actually fighting each other was finally outlawed. When Cirroc the Lofty rose to power, rifts within this guild of thugs widened still further: This Redguard was not of Atmoran stock. As expected, his reign was brief, although it did instill a martial prowess in the bladework of those he taught. An Elven Harbinger would have been unthinkable until Henantier the Outsider claimed power. His rise was as tedious as a Breton ballad; he was made to toil in mundane servitude until he outlasted all the others better suited to the role. Next came Macke of the Piercing Eyes. Her story is preposterous; it is said she routed half an advancing army with only her gaze and slaughtered the rest with her blades alone. Her unexplained disappearance ushered in the Second Era, a dark time for these pretend paladins. It was only when Kyrnil Long-Nose fought to restore Jorrvaskr from this corruption that the old ways of venerating honor through blood returned. Your interaction with these warmongers should be polite but curt. Beware of their skill in battle, and trust them with nothing more valuable than your time. I was made most welcome at Fallowstone Hall. For a start, I was able to refuse the offer of mead without offending my hosts. I was surprised to see other races -- even a Khajiit -- among the warriors within. As for the structure itself? It was a building so secure its foundations seemed to sprout from the foothills of the Velothi Mountains. The timber and woodwork were of surprising quality, with firm trestles and good use of fir and pine. My only gripe was the abundance of carved dragons affixed to every gable end; such carvings border on idolatry. During the evening's drinking, I felt uneasy. Vigrod was not the cause; his stories and legends of the Companions would fill three volumes of yore, although I was instructed not to transcribe them (many were from the time of Ysgramor, and the use of his fabled axe Wuuthrad, which is apparently kept in one of the many vaults under this hall). No, I suspected forces more fiendish were at work, so I excused myself for the night, took to the guest quarters, and prayed for a restful interlude. Mara did not listen. Despite a bedding of dry, recently washed skins and rough linen, my night terrors returned. And grew worse: Mannimarco pursues me. He takes the form a ghost giant, glowing blue in the dim glow of Masser. He cracks his club against my head before picking me up and pressing his thumb deep into my throbbing brand. The sooner I flee this north country, the better. The next morning I woke to find myself abandoned at the gates of Riften, with no memory of my flight there. I left for Mournhold aboard a mead caravan both perplexed and unwell. This page was last modified on 21 January 2019, at 13:32.